According to various New Testament Gospels, there are a number of things that we can surmise about Peter and Andrew that help us understand them in conjunction with their livelihoods. There are also a few things that, when their social contexts are taken into consideration, can shed light on their travels and movements as fishermen. Let's begin by glancing at a few NT passages. (1) Mt. 4.18 tells us that Andrew and Peter were brothers. (2) Jn. 1.44 says that these two brothers were from the town of Bethsaida, which, in Hebrew means "House of (the) fisherman". (3) Mk. 1.29 seems to suggest that both Peter and Andrew moved to Capernaum. (4) Mk. 1.16 also purports that they were in a fishing business together. Now, let's look at some other biblical and extra-biblical comments that may shed more light on Peter and Andrew's lives. (1) In both Antiquities 17.188–189, 18.106-108 and War 1.664, the ancient historian Josephus tells us that on the east side of Lake Galilee, Herod Philip II (or, Philip the Tetrach) ruled and on the west side of the lake, Herod Antipas ruled. (2) Mk. 2.13-7 tells us that in Capernaum, a border town between the regions of Philip and Antipas, tax collectors enforced their services. (3) In antiquity, taxes on boats, docks, fish, etc. were the norm. See: Pliny, Natural History 12.32, 12.63-65 and 31.95. 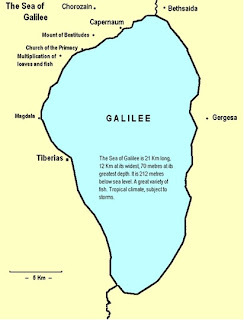 This was also true of the Galilean lake regions. (4) We also know that Bethsaida was/is Northeast of Capernaum (see the map). Putting all of this together, we can now understand why, as Mk. 1 tells us, both Peter and Andrew, fishermen and brethren, relocated from Bethsaida to Capernaum. Firstly, it is clear that to some degree, the brothers did relocate (Peter even brought his mother-in-law along). Secondly, every time they passed through Bethsaida and Capernaum, hitting up two different toll booths, they would be double-taxed. Now, as I have argued before, not only did the disciples know Jesus before they "followed" Him (for an in-depth reflection on this, CLICK HERE) but they also didn't leave their families and business forever to follow Jesus (CLICK HERE and HERE for more on that). Just as well, I have written about Jesus and these fishers upsetting the Galilean marine economy (sorry, no link to that). In the present post, I want to briefly add more to this and suggest two things: 1) "Double-taxing" led to the brothers relocating, and 2) Screwing with the marine economy was not only bad news for Jesus but also a warning to those who followed this self-proclaimed "fisher of humans". Strike one against the empire was the fact that they moved! No more double-taxes from these guys for the Roman government. Strike two against these guys was that they followed Jesus. A part-time break means even less taxes raised for Rome. Strike three comes for them when they follow Jesus who is supposedly setting up a new type of fishing business (e.g. fishing for humans). Furthermore, a threat is felt when this new businessman starts buddying up with Levi, a puppet of the Roman government. Perhaps they're scared that he'll begin working with Jesus or attempt to cheat them! The ball game finally ends with Jesus and those following Him having bounties on their heads. So, as we can see, wrapped up in the Gospel accounts (and lurking below the muddied waters of simplistic modern evangelical hermeneutics) there is much more going on than meets the eye! Jesus and His followers are being terribly subversive. Even more than that, some of Rome's followers are becoming subversive. Of course, the only way to end all of this is to kill. So, the economic and political leaders team up with the religious ones and begin plotting to do just that (Mk. 3.6)! *Update: I have found an incredible essay by K.C. Hanson on the Galilean fishing economy, CLICK HERE to read it. not buying what? all i am arguing is that they moved from bethsaida to capernaum because they didn't want to be double-taxed anymore. after that, i am simply suggesting that all of these little ways of taking money away from the empire was viewed with annoyance; following Jesus only compounded those problems. what's not to agree with about that?